ROCK HILL, S.C.–Kallista, a designer and provider of luxury kitchen and bath products, unveiled its GridTM sink faucet at KBIS 2018 earlier this year. 3D Systems' Direct Metal Printing technology was instrumental in bringing the first-of-its-kind sink faucet–produced by 3rd Dimension using 3D Systems' 3D printing materials and technology–to market. According to a release from 3D Systems (www.3dsystems.com), its technologies enabled Kallista to "design without limitations" in its efforts to bring the product to market. 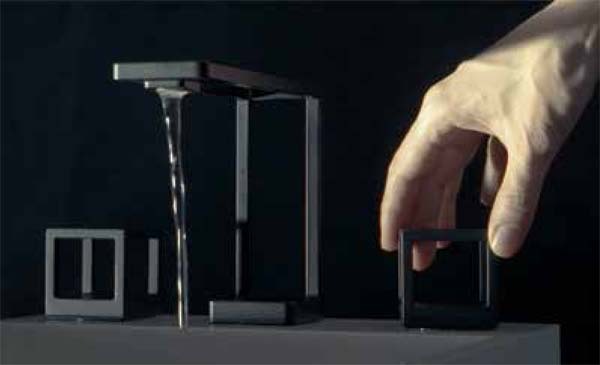 Kallista's design team embarked on a journey to create a faucet in a unique geometry. In deciding to produce the spout via 3D printing, the designers were able to design without limitations to create an open form and discrete interior channels that allow water to flow easily through the base. "Designers usually need to consider a manufacturing process, and they have to design around that process," said Bill McKeone, design studio manager at Kallista, in a statement. "By choosing to produce this faucet via 3D printing, we opened ourselves to limitless design possibilities. 3D Systems' breadth of materials and technologies allowed us the freedom to create a unique, functional faucet which would not have been possible with a traditional manufacturing process." The faucets were produced by metal 3D printing specialist, 3rd Dimension, a production metal manufacturer specializing in 3D direct metal printing based in Indianapolis. 3rd Dimension (print3d4u.com) employed 3D Systems' ProX® DMP 320 high-performance metal additive manufacturing system. To avoid rust and corrosion, the faucets are printed with 3D Systems' LaserForm® 316L, a high quality stainless steel 316 powder material. "In order to realize the best product, you have to start with the best tools," said Bob Markley, president, 3rd Dimension, in the release. "The strength of the 3D Systems technology and materials, coupled with the expertise of our engineers and machinists, allowed us to rapidly produce and deliver these high end faucets for Kallista." As this was the first additively manufactured product for Kallista, the team at 3rd Dimension led them through a program to develop the as-designed concept for the 3D printing process. Developing the design for additive manufacturing meant that Kallista was able to avoid the common delays of weeks or months needed for any kind of production tooling. 3rd Dimension's experience with the 3D Systems ProX DMP 320, and its engineering expertise, enabled Kallista to produce the Grid faucet flawlessly. Because of the efficiencies and repeatability afforded by 3D printing, the parts were rapidly produced within hours. "This is just one example of the value 3D printing brings to a production environment," said David Cullen, director of applications engineering, 3D Systems, in the release. "Through the combination of materials, print technology, software, and services, Kallista was able to bring their visionary design to market."